My sister visits me every six months to bring me to comedy bars though she knows I don't drink. I eat and sip coffee, occasionally smoke and I enjoy going to comedy bars, The Library, Laffline, 22nd St, Metro and Punchline because it had become a bonding moment for the two of us for years now. The entrance fee of P500 on Fridays, Saturdays and Sundays and P250 on Mondays to Thursdays is too pricey for me and I hardly make the effort to go because I am alcohol intolerant. May 19, 2010, 10pm and its a Wednesday so Ethel Booba (as shown in the picture) was the main star of the show along with comedy bar entertainers, the wacky group of Foxy Ladies, Le Chazz, Nonoy Abnoy, Arnel Chika, Martin D Icon, Ferdie, Jayo and the 3rd season Pinoy Pop Superstar finalist Jenny Esclanada. My sister ordered 2 San Mig Lights (P82@each), a glass of Margarita for Kay (P130), a shot of Absolut Vodka Currant (P120), french fries (P120), cheese sticks (P150) and brewed coffee for me (P90). Primetime started at 11:45pm and we were distracted with the aroma of carbonara of the gay couple (obits as in lesbians) seated in front of us. Before we ordered I asked how the taste was and the girls said, "taste really like Italliani's", so my sister and I was convinced to get one. 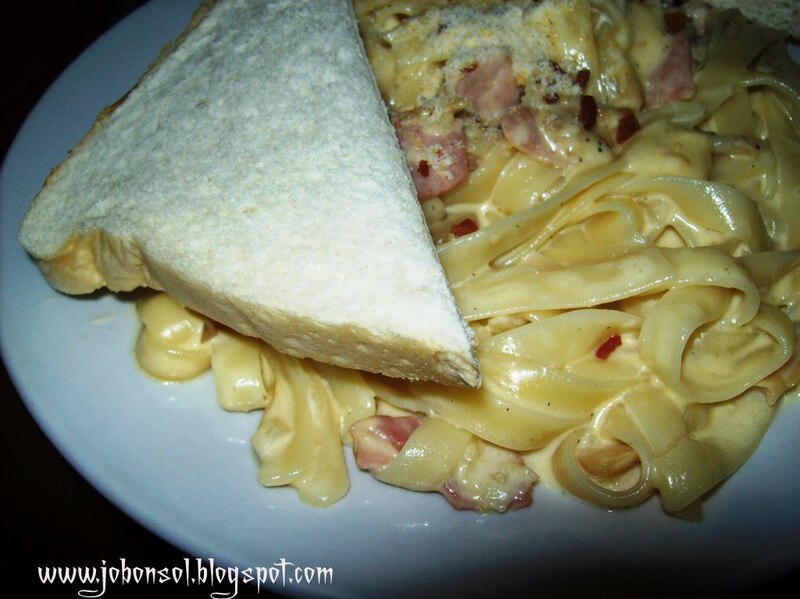 At P160 a plate, the fetuccini carbonara they served was really delicious. I don't know if they have changed the chef because it wasn't the same taste when I ordered the same food before. The creamy cheesy bacon-ey sauce makes you feel like you've eaten in real Italian restaurants. I know I came here to enjoy the comedy of Punchline but it was my first time to enjoy food though I've frequent the place for years. Of all the comedy bar hosts, the most entertaining for me is the segment song renditions of Jenny Esclanada. I may have been too familiar with gay lingo, gay stories and gays' and comedy bars' punchlines that I seldom laugh that much anymore. I still enjoy Nonoy Abnoy and his discourse with Le Chazz though. They are both spontaneous, witty and original in their dirty talk on stage. The punchline of the night was entering the place with a sign that says Ethel Booba on stage (shown in picture) and leaving at 2:15am seeing the sign changed the main act to Le Chazz. I guess the people who entered the place didn't mind at all. 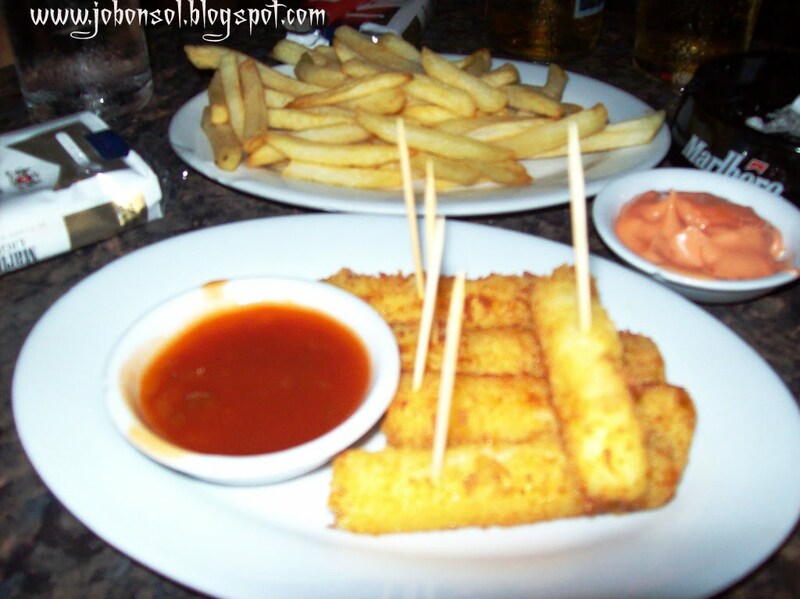 After all, without Ethel Booba, Punchline is a great comedy bar with great food. 1. Come to comedy bar with a "comedy bar culture". Be ready to be mocked, teased, harassed and humiliated in front of all people. It is a culture. Otherwise, you went to the wrong place. The comedy bar hosts introduce these warnings and precautions to patrons before starting the show. 2. Punchline has great service. Each table has a personalized waiter in uniform and ID with courtesy and grace that makes this place really a great place for entertainment. The waiters are well-trained and they'll guide you with all the conveniences.Thank you Arnold! 3. When ordering hard drinks or cocktails, it's best to go directly to the bar and see the bartender mix your drink rather than wait til they serve it to you. My sister is so familiar with this culture and she gets her own drink from the bartender. "Sometimes, some bars give you less than a jigger of the real alcohol so you better get it straight to the bartender to not be deceived", she said. 4. Do not attempt to request for a song unless you give a generous tip to the hosts. Otherwise, they'll mock you up front and really blatantly announce your name and face as stingy. You can sing and ask them to sing with you to ease your stage fright (like what my niece did) because this is still a karaoke bar. 5. Do not bring kids. This is an adult place and you're supposed to be responsible parents enough to get your kids to bed at 11pm. The hosts are also considering the families bringing kids but they will really be exposed to profanity. I see a lot of young kids ages 5-7 until now. OMG! Enjoy the show! You'll get discount cards of 50% after paying the bill and since the show is always great, I bet you'll imbibe the culture and be one of the regulars once you've tried it.